The AIA Westchester Hudson Valley Chapter invites you to join us for a tour of the spectacular Untermyer Gardens! Untermyer Park and Gardens, located in Yonkers, was part of the estate owned by Samuel Untermyer. The gardens were designed in 1916 by Beaux Arts architect William Welles Bosworth who also designed the Rockfeller gardens at Kykuit. At their height, in the 1920’s and 30’s, they were one of the most celebrated gardens in America. 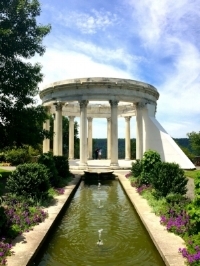 After year of decline, the gardens have recently gone through a restoration led by the Untermyer Gardens Conservancy, a non-profit organization founded in 2011 by Stephen F. Byrns. The Conservancy collaborates with the City of Yonkers to facilitate the restoration of Samuel Untermyer’s gardens. Untermyer Park and Gardens is located at 945 N. Broadway, Yonkers and parking is next to the Community Center or on the street. Tours will begin at the west side of the Cola Community Center.